Gmail is an excellent mail client, but one feature that has always felt missing was a simple sorting ability to view only the unread email messages residing in an inbox. It turns out you can show only the unread messages with Gmail though, you just have to use either a simple search operator to reveal only unread messages, or use a different Inbox sorting method that displays unread emails first regardless of the message age. Using either method is very simple, so pick whichever is best for your situation. 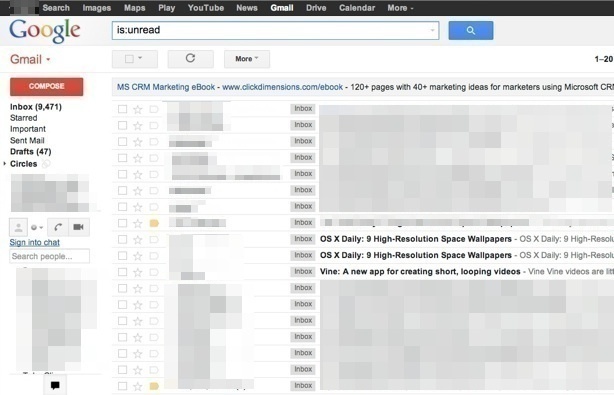 This tutorial will show you two different approaches to easily view and see unread messages in Gmail. The Gmail inbox will be sorted to only display messages that haven’t been read yet, this search operator is practically instantaneous regardless of how giant (or small) your unread mail count is. Yes, this search tricks works on the web with any web browser, whether it’s Gmail in Chrome, Safari, Edge, Internet Explorer, FireFox, Opera, or whatever else, in addition to the common mobile Gmail apps for iPhone, iPad, and Android. That will display only the unread emails for the “Primary” inbox, rather than the entire inbox. This is another significant advantage to webmail, since the task of sorting giant inboxes is handled by a remote server, it relieves the local machine of the disk and CPU intensive activity of sorting through potentially hundreds of thousands of past messages to find the 9000+ unread emails residing in the inbox. This screen shot example may be a bit extreme, but even my personal email has over 200+ unread messages at any given moment. To reveal the normal inbox again with all read and unread messages together, either remove the search operator from the search box and hit return again, or just click the “Inbox” item from the left side menu. Despite being such a simple feature, it doesn’t seem like common knowledge. I’ve been using Gmail for many years and didn’t know about this trick, and its as only in a passing conversation with a friend that I learned about it. Unread messages will instantly sort to the top of the inbox, and the search operator will no longer be necessary unless you don’t want to see the read messages at all. Either of these tricks are incredibly helpful for those of us who manage large inboxes, where new unread messages routinely get pushed off the front pages of the inbox, and inevitably end up buried several screens back with a bunch of already read mail. As we all know, once an email message ends up off the primary inbox screen, it’s pretty easy to forget about them, which only adds to the feeling of inbox overload when the unread count is reaching into the high numbers. If Gmail is your primary email service too, don’t forget to set Gmail as the default web mail client for your web browser too. Brilliant tip – thank you! Thank you VERY much. Google ought to employ you, if only for your persistence and capacity to give simple instructions. I concur. Thank you Paul Horowitz! Thanks so much for this quick tip – nothing could be simpler than is:unread! How about a button to filter by unread. This is available in Outlook and should be here as well. Great Article. One question would be how to show unread emails at the top but still stay in the “Default” Category Labels mode? That just shows all unread messages. I send many unread to different boxes (Orders/Orders Generated/Payment Received etc) What I need is unread in the Inbox. Any tips? You’re welcome, it’s a great trick I use it all the time! Thank you, Selena, that is extremely helpful. This is just what I was looking for, thank you! Selena – I know you posted this answer about 3.5 years ago, but I found it today and wanted to shout THANK YOU at the top of my lungs. Thanks for this tip Selena. you posted this solution 4 years back but this has helped solve a very annoying issue for me. 2nd option does not get ?? I tried everything you mentioned, still show 8 unread email in my inbox. Congrats on only having 8 unread emails! Sweet! Thanks for your help – searching manually is insanely cumbersome. This will give you only unread messages in “Primary” category. This was the trick even over a full year later! Thank you and I hope to share this with my other friends who are “fishing” for the UNREAD! Sameer, this tip was extremely helpful. I just got migrated to GMAIL and was struggling for help with this option. Thank you very much!! Now how do you “move” unread emails out of the Inbox? There’s an option to move to the Inbox except they’re already there. You can drag them to a different “label” but then they are marked as in the Inbox and in the other “label”. Why gmail has to do everything in a different way than has always worked just boggles my mind. This works for me… category:primary is:unread While in Gmail just type this into the Google Search bar…adjust primary to be social or what other tabs you have to organize your emails. This will only show the unread emails from that particular category in your inbox. I used to have the unread emails at the top of my inbox. And somehow I accidentally go rid of it. So I couldn’t remember how I did it and came across this article. But it doesn’t seem to work. Has the software changed. I see the setting gear, but nothing that works. Gmail is the same, you have to enable the features as described here. Also be sure to turn on the universal inbox and turn off the awful sorting thing that sticks messages into tabs like nobody wants. Do both. Is there any way to get a view in the gmail mobile app that shows only unread emails? Typing the search every time is very time consuming. In the desktop (online) version, I can setup a priority inbox to show unread first, starred next and everything else last… each in its own neat bucket. After a lot of mooching around I can still find no way to group the unread mails other than by searching , which is so easy to back out of, requiring me to redo the search. How to select all and delete all unread??? Thank you Very much for this valuable suggestion, i was knocking each set of mail to delete. Awesome! Just what I was looking for. Fantastic tip! I have long been frustrated by this. I want to view my email that I have received on the 19 September 2016 from unisa. I want to view my email that has not been opened yet. I cannot access my inboxe plz! I have one problem and that is when I get in to my E-mail account am facing difficulty on how to view the messages that is in the inbox,please I need help. Nailed it for me. Good luck! Thanks for the tip, is there a way to show unread items but exclude Inbox. You cannot show ALL unread emails in inbox with the “Settings > Inbox > …”. It works ONLY if the emails are _not filtered to go to a folder/”label”. It will not show unread emails if they have a “label”. If you know of another way, please let us know. Somewhere in time, I have 82 emails in my “Primary” Inbox. When I use the methods from this article, it brings up the thousands of emails in all three categories of “Primary”, “Social”, and “Promotions”. Is there a way to narrow it down to those 82? It’s driving me bonkers! Thank you. The fact that I had to look this up in order to do simple so basic disproves the point about Gmail being “an excellent mail client”. This helped me so much! Thank you for help me get out from under nearly 1400 unread email that were hidden! Thanks . This is exactly what I was looking for – unread from Primary and tricks u mentioned workesd.